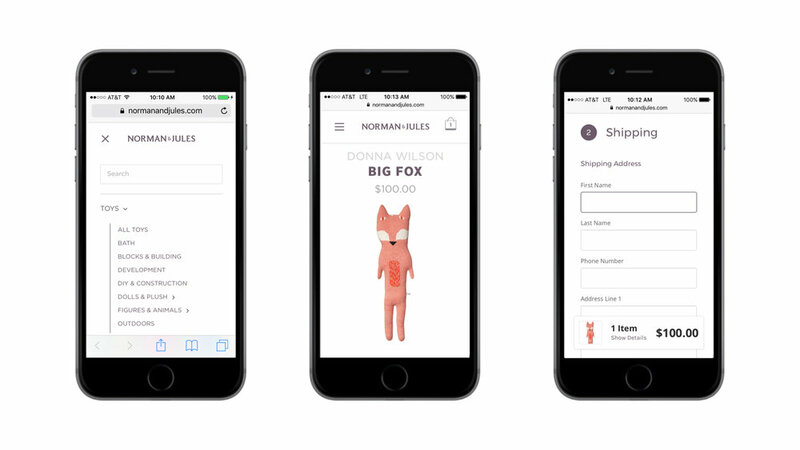 Create a streamlined and modern shopping experience from web to mobile making Norman & Jules distinctive within their market and to their target audience. Re-design the site to be more user friendly in order to build brand loyalty and increase conversions. Connect the online store experience, new look and feel, with their existing brick and mortar location in Brooklyn. Make it easy for customers to filter for products. Display commonly viewed, related, or recommended products on individual product pages. Update the global search functionality within product grids to allow customers to quickly locate products. Provide a guided shopping experience, focusing users' attention, through curated groupings of related items. Improve visibility of items in the shopping cart. I identified 3 types of customers and their needs to design the site around-- local customers, the gift giver, and international customers. Through short discussions with friends and family, I was able to understand the online shopping experience for children's toys, clothes, and accessories. User stories were presented to the client to validate their customer base. Design recommendations were presented taking into account business requirements, project timeline and scope, and the technical capabilities of the client's e-commerce platform, Lightspeed (later Big Commerce).